The June 2014 issue of Safari – a Science and knowledge magazine from India – hit the newsstands on time and here is what we found in the same. 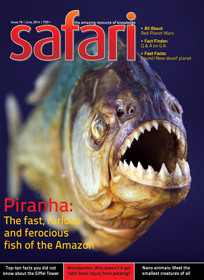 First thing first, the cover page shows the front-view of a Piranha fish, which makes the magazine look like a wildlife magazine! The cover page is not very attractive but the inside cover page shows a very high resolution photograph titled The great migration. It shows a glimpse of the migration of more 15,00,000 wild-beast from Tanzania to Kenya! Well, it is the migration effort for the survival purpose. There is a very brief summary also found written on the photograph. A nice one. The table of contents is now more informative. But, the lack of – editorial – is a loose end of this issue. For Your Information – section – contains the following articles. 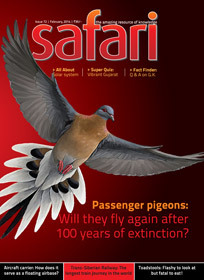 The same segment have a single page article about Birds and their routines during the long migration journey. Bird lovers and enthusiast will find this article interesting for sure. When ants go marching they count their steps – is again an article oriented to bio-zoo-logy. It is written in nice way though and is worth reading. A six page article about Piranha Fish found in the the Amazon, is really very consolidated. The writing style of B. M. Purohit made it even more enjoyable to read. The article have some interesting photographs as well. Some photographs have historical value as well (Eg. the photograph where we see Gen. Fawcett shaking hands with local guides – when he visiting Amazon forests – probably in 1906). The article also brings information about other animals like the Brazilian capybara, which is one of food items of Piranha! Do you know that the locales even apply poison to the teeth of Piranha and use it as a bullet of their gun made from hollow bamboo!!! The article has many such other information. A really informative and not to miss article. The people associated with Information Technology field will find a small article about Computer Virus and its invention, attractive. Though you definitely feel that the article deserves a lot of information and may be full-length article is a better solution to satisfy reader’s curiosity rather than this summarized one. Paris is famous for a lot of things, but the name of Eiffel tower, definitely comes at the top of all attraction found there. It is about 125 years since the tower is there and is now a universal identity of Paris. A very large amount of stuff is written about the same, and almost every enthusiast know a lot about it. Ravindra Acharya’s 4 page article about some unknown (or less known) facts about Eiffel tower is added with number of images as well. Enthusiasts should not miss reading it, for sure. The fast facts segment is focused on a newly discovered dwarf planet – 2012 VP113. It is a set of summarized information and is for those who love to read about astronomy. There is one article found about woodpecker in this issue. the article is not very attention grabber at the first glance. But as you start reading and go deep into, it prove a good to read one. It brings information about the anatomical facts which made it a wonder in a specific field. The article then discuss it with some contemporary examples. A 4 page article by Samarth Vyas, about the largest aircraft of the world and its first flight; is for those who are interested in historical events. The article brings in some interesting and a lot of less known information about the even which was almost a flop-show. The Internet is now a part of our lives. And day by day the usage and even dependency on the same grow highly. It bring us a new kind of language, popularly known as – Internet Lingo. We see people are using shorter words during communication (eg. thx – for Thanks; u – for You; c u – for See You,… the list is say endless!). This brought us to a situation where we see the sentences got smaller and the use of , (comma – the punctuation mark) is avoided at large extent. Is it the time when there will be a full stop on the use of comma?! A small but nice article bring various views on the same. It is not to be missed. Potato slices (made for wafers) are even and flat before frying, but become crooked once fried. Why is it so? How is the colour for uniform of various countries’ cricket teams decided? Why does raw chilli lose its pungency after frying in oil? At one time, pencils were available only in yellow colour. Even today, most of the pencils available in countries like the USA are of yellow colour. Why is it so? Eskimos make their Igloo homes using ice. How does an ice house keep them warm in the extreme cold climate? What is the meaning of “wiki” in the well known online encyclopedia – Wikipedia? The chalk used to write on a black-board is made up of which material? Is there any truth in the claim made by some mineral water manufacturers that their water contains immense amount of oxygen? Is it true that the ATM machine was invented by an Indian engineer? What types of railway engines are manufactured by the Chittaranjan Locomotive Works? What is Phantom Pain as per medical science? Why pain is felt in a part of the body which has been lost, and does not exist anymore? How much portion of the celestial sky have astronomers been able to observe through the Hubble Space Telescope’s “eye”? Why does a banana fruit grow point upwards, even though the bunch grows facing downward? The last cover page article brings – all about Mars. It is very informative article and worth to go for. Overall, a magazine worth your money and most importantly your time you spend to read it. 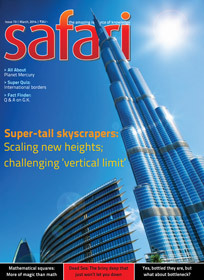 These days it became even more tough to find quality magazine with affordable prices which bring something positive to the readers, Safari – is definitely worth going for. 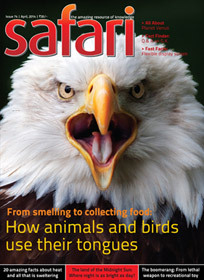 This issue, in the first half have lot of biology and zoology related stuff. It gave us the impression that it might have only similar articles and we might be reading another wild life magazine. But the last segment brought some variety in the content. If the content was mixed up (in terms of article placement) it could have been more appealing to the readers.